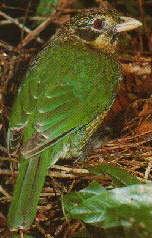 · In Australia the Spotted Catbird is restricted to north Queensland. · It is a bowerbird but is not polygamous and does not construct a bower or display court. · The distinctive wailing call is uttered mostly at dawn and dusk. · These birds are so named for their distinctive, cat-like call (like meowing). altitudes. Breeding adults generally live in permanent territories. bonds year after year. The birds raise their young together. three. The breeding season is from September to December. become independent of their parents at 60-80 days after fledging. to feed to their own offspring. · The male and the female are both 26-30cm and look identical to each other. they often perch on balconies or window ledges.